Amongst a trio of recently acquired early 1900s F. E Dodge drums is this splendid orchestra model, circa 1904 - 1907. 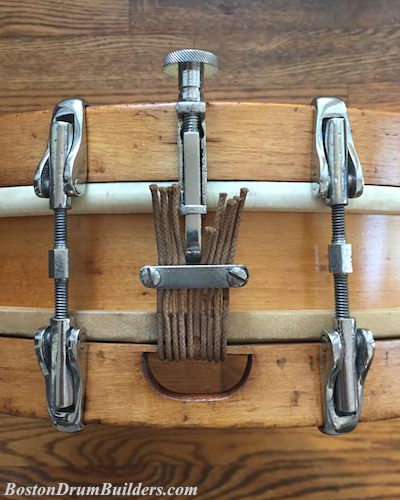 Complete down to the original "Satin Finished Water-proof Snares", this drum is a wonderfully well preserved example of turn of the century drum building ingenuity and craftsmanship. 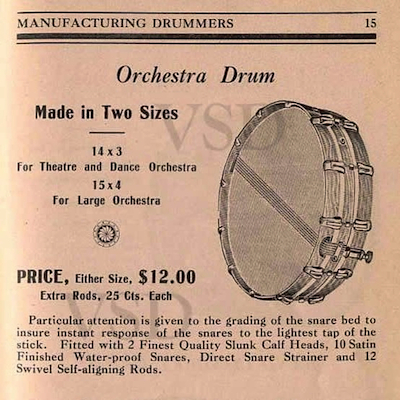 The 1907 Dodge Drums Catalog lists the Orchestra Drum in two sizes. The 3" x 14" drum seen here joins a 4" x 15" already in the collection. 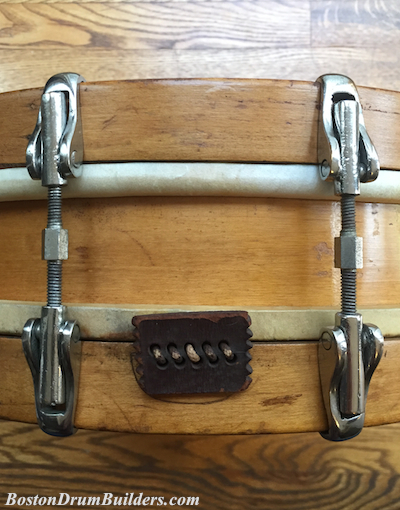 The single-ply maple shell and hoops are both characteristic of Dodge with the shell featuring shallow reinforcing rings and a polished rosewood grommet. A small circular makers label is affixed to the inside of the shell. Note the inclusion of the "Inc." lettering which likely means that this drum was produced after the company's 1904 incorporation. Distinctive to many Dodge drums from the first decade of the 1900s is the use of an early style of swivel nut to accommodate the tuning rods. Though the nuts only swivel in one direction, they still represent an advancement beyond traditional collar hooks. 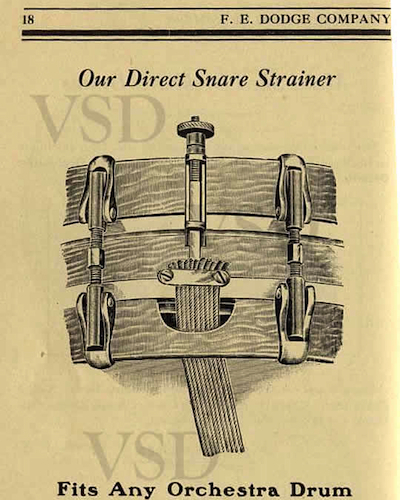 Dodge's "Direct Snare Strainer" with its square shaped shank allowed for tensioning of the snares via an adjustment knob mounted to the top hoop. A simple leather anchor holds the snare wires in place against bottom hoop opposite from the strainer. Note the jagged edges of this leather piece, an unusual little cosmetic touch seen on many early Dodge drums. Though the wooden shell and hoops show their age, the nickel plating is in excellent condition, a testament to the quality of the materials and processes used by Dodge. Period correct calfskin heads put this drum in historically accurate condition for display. 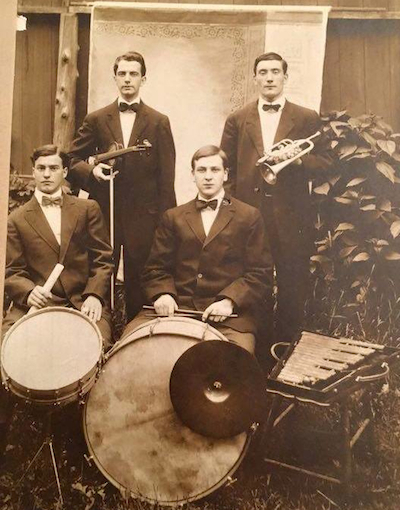 A photo of the original owner gives us a glimpse of the drum in action roughly a century ago. 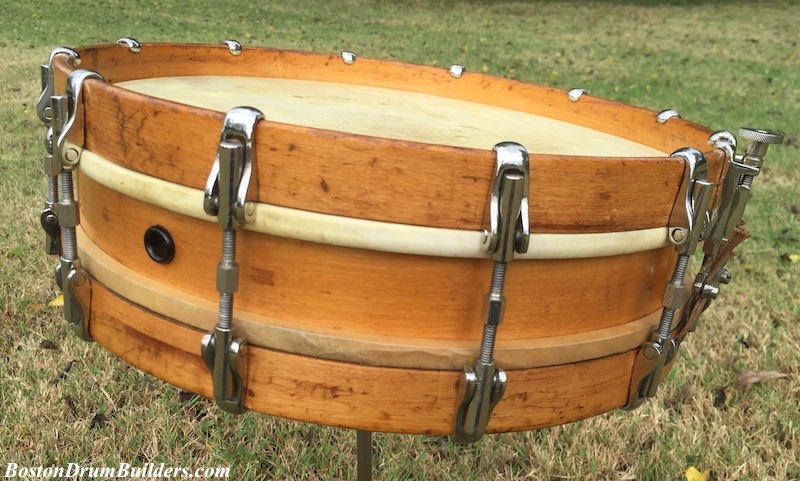 Do you have a drum by F. E. Dodge? I'd would love to hear about it! Send Lee an email at lee@vinson.net. 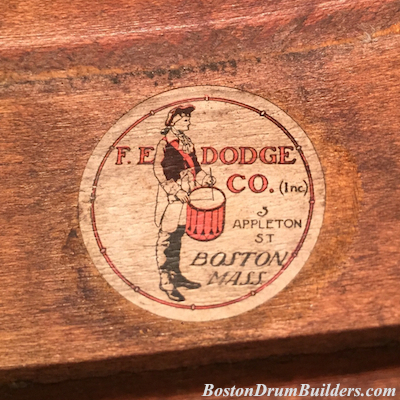 And for more on F. E. Dodge and the other early 20th century drum makers of Boston, Massachusetts, please visit BostonDrumBuilders.com.